Remember to forgive, if you have anything against anyone, so that your Father also who is in heaven may forgive you your trespasses, don't be angry and do not sin; do not let the sun go down on your anger, and give no opportunity to the devil, do not rejoice when your enemy falls, and let not your heart be glad when he or she stumbles, for if you forgive others their trespasses, your heavenly Father will also forgive you, but if you do not forgive others their trespasses, neither will your Father forgive your trespasses, be kind to one another, tender-hearted, forgiving one another, as God in Christ forgave you, know this, my beloved brothers: let every person be quick to hear, slow to speak, slow to anger; for the anger of man does not produce the righteousness of God, strive for peace with everyone, and for the holiness without which no one will see the Lord anyone whom you forgive, I also forgive. 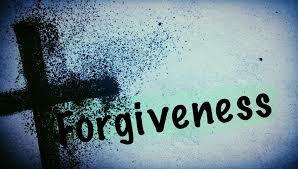 Indeed, what I have forgiven, if I have forgiven anything, has been for your sake in the presence of Christ, so that we would not be outwitted by The Devil Satan; for we are not ignorant of his designs, if we confess our sins, he is faithful and just to forgive us our sins and to cleanse us from all unrighteousness, let no corrupting talk come out of your mouths or any filth, but only such as is good for building up, as fits the occasion, that it may give grace to those who hear, and forgive us our debts, as we also have forgiven our debtors, put on then, as God's chosen ones, holy and beloved, compassionate hearts, kindness, humility, meekness, and patience, bearing with one another and, if one has a complaint against another, forgiving each other; as the Lord has forgiven you, so you also must forgive, for whoever lacks these qualities is so near-sighted that he is blind, having forgotten that he was cleansed from his or her former sins. Put to death therefore what is earthly in you: sexual immorality, impurity, passion, evil desire, and covetousness, which is idolatry, on account of these the wrath of God is coming. In these you too once walked, when you were living in them, but now you must put them all away: anger, wrath, malice, slander, and obscene talk from your mouth, do not lie to one another, seeing that you have put off the old self with its practices, The thief comes only to steal and kill and destroy, I came that they may have life and have it abundantly, if anyone says, I love God, and hates his brother, he is a liar; for he who does not love his brother whom he has seen cannot love God whom he has not seen, not everyone who says to me, ‘ Lord, will enter the kingdom of heaven, but the one who does the will of my Father who is in heaven, be sober-minded; be watchful, your adversary the devil prowls around like a roaring lion, seeking someone to devour, therefore, confess your sins to one another and pray for one another, that you may be healed. The prayer of a righteous person has great power as it is working. But God, being rich in mercy, because of the great love with which he loved us, even when we were dead in our trespasses, made us alive together with Christ by grace you have been saved and raised us up with him and seated us with him in the heavenly places in Christ Jesus, so that in the coming ages he might show the immeasurable riches of his grace in kindness toward us in Christ Jesus, for by grace you have been saved through faith, and this is not your own doing; it is the gift of God, for if you live according to the flesh you will die, but if by the Spirit you put to death the deeds of the body, you will live. Do you not know that if you present yourselves to anyone as obedient slaves, you are slaves of the one whom you obey, either of sin, which leads to death, or of obedience, which leads to righteousness, whoever has my commandments and keeps them, he it is who loves me, and he who loves me will be loved by my Father, and I will love him and manifest myself to him, he saved us, not because of works done by us in righteousness, but according to his own mercy, by the washing of regeneration and renewal of the Holy Spirit. How long must I take counsel in my soul and have sorrow in my heart all the day, how long shall my enemy be exalted over me, consider and answer me, O Lord my God; light up my eyes, lest I sleep the sleep of death, lest my enemy say, I have prevailed over him, lest my foes rejoice because I am shaken casting all your anxieties on him, because he cares for you, that he might sanctify her, having cleansed her by the washing of water with the word, For his invisible attributes, namely, his eternal power and divine nature, have been clearly perceived, ever since the creation of the world, in the things that have been made. So they are without excuse. See to it that no one takes you captive by philosophy and empty deceit, according to human tradition, according to the elemental spirits of the world, and not according to Christ, do not be conformed to this world, but be transformed by the renewal of your mind, that by testing you may discern what is the will of God, what is good and acceptable and perfect, for it is time for judgement to begin at the household of God; and if it begins with us, what will be the outcome for those who do not obey the gospel of God nothing but uncertainties. Amen.